Photo courtesy of the Telegraph and Argus. The rapturous scenes of celebration witnessed last night at Valley Parade will stick in the collective Latics memory for years to come. It was certainly a good goal, Michael Jacobs slotting home from Will Grigg’s sublimely weighted pass. But it was more than that. It was a reaffirmation that Wigan Athletic are serious contenders for automatic promotion from League 1. It had been a scrappy game against a Bantams team that was barely recognisable from the one that played such good football in winning at the DW Stadium in November. Stuart McCall was sacked in early February after six consecutive defeats. With him went the stylish football we had seen, to be replaced by a long ball approach under Simon Grayson. 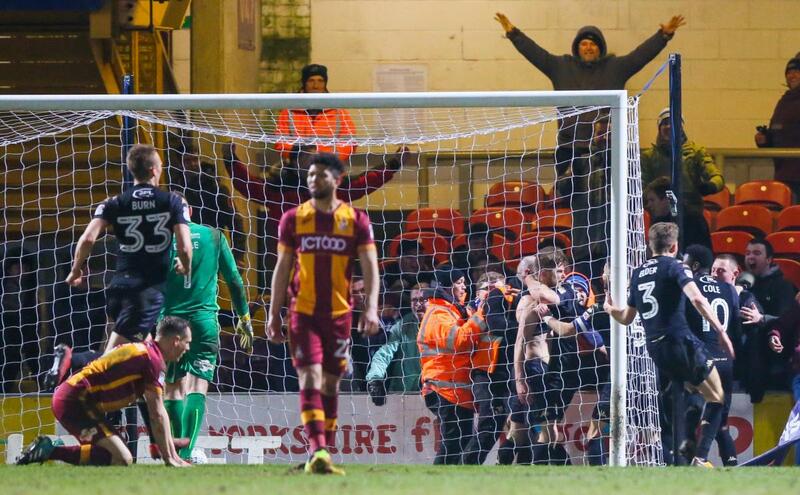 Dan Burn and Chey Dunkley gobbled up those high balls and, as a result, Bradford City posed a minimal threat on the Wigan goal. They have now gone nine games without a win. On paper an away win would have appeared a good bet to make, but despite Wigan’s dominance and coming close to scoring several times, it looked like the game was to remain goalless. But this Latics team is certainly resilient and they kept plugging away until that moment of magic in the 91st minute. The type of football we saw from Latics last night was nowhere near that silkier brand we had seen so often in the latter months of 2017. This was based on sheer effort, with lots of long balls and crosses flung into the penalty box seemingly willy-nilly. But, nevertheless there was a rekindling of the kind of tackling and movement that had been so prominent in Wigan’s play in brighter times. Players who had looked jaded and sluggish against Scunthorpe on Saturday had somehow been beamed back to their previously high-energy states. Ever since the arrival of Owen Coyle, Latics had just never looked as fit as many of the teams they had played. But Paul Cook and his staff have transformed fitness levels in such a way that one wonders why previous regimes had not been able to do so. For it to be successful Cook’s style of play needs players with energy and enthusiasm in abundance. If either is lacking it can flounder as we have seen in recent weeks. After the game Cook had talked about “going back to basics” and that is what we saw last night. The tackling was keen, the movement was there. What was in short supply was poise, until that memorable moment in time added-on. But that will surely return if those energy levels can be maintained. Beating a team that had already lost 8 home games and in such awful run form might seem unremarkable, but it could prove to be the psychological turning point in Wigan’s season. Those rapturous celebrations showed us just how important that win was to the Wigan players. Blackburn and Shrewsbury will surely have taken note that Latics are back on track and are once more serious contenders for those automatic promotion slots.